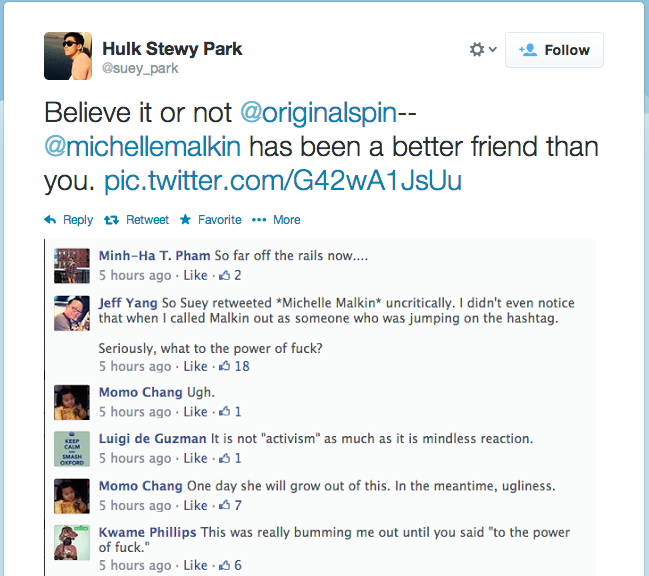 Move over Mikki Kendall and Suey Park, the new leading Social Justice Warrior in town is Michelle Malkin. Here she responds to Steven Colbert with the classic SJW whine. Question: Who are the most prominent, public purveyors of Asian stereotypes and ethnic language-mocking in America? The right answer is liberal Hollywood and Democrats. The wrong and slanderous answer is conservatives, which is what liberal performance artist/illegal alien amnesty lobbyist Stephen Colbert wants Americans to believe. Last week on his Comedy Central cable show, Colbert resurrected his “satirical” 2005 “Ching Chong Ding Dong” skit, in which he speaks in pidgin English with a grossly exaggerated accent. He used it in a bone-headed attempt to ridicule Republican football team owner Dan Snyder and others who defend the Washington Redskins’ name. A group of diehard liberals, led by a young Korean-American writer, Suey Park, gave Colbert a hard time about his cringe-worthy act, which was accompanied by an awkward laugh track and left the distinct impression that the real Colbert enjoys crude ethnic-language mockery just a little too much. Park and her liberal Twitter followers tenaciously questioned Colbert’s use of “satire” that ends up stoking the racism it purports to mock and abhor. They obviously picked the incendiary #CancelColbert hashtag to force attention on their complaints. My view is and always has been that the answer to speech you disagree with is more and better speech. For me, #CancelColbert wasn’t about censoring his show. It was about exposing his hypocrisy and don’t-you-understand-satire double standards. Park complained that Colbert and his defenders were race-baiting liberals who hid behind their self-professed progressivism. Absolutely. Progressives of pallor – hipster racists – have said and done some of the most bigoted things I’ve ever witnessed in my life and gotten away with it. And as one Asian viewer noted, Colbert “obviously didn’t use satire very effectively because most people aren’t talking about the Redskin issue or Dan Snyder.” Indeed, many of his fans were too busy tweeting non-satirical anti-Asian bigotry, misogyny, and ugly death threats. And no, they don't understand satire, as Colbert noted in his new hashtag #CancelSwift.